Home / EUREKA HOMES – FLOOD RELIEF AID IN ANNA NAGAR, KANCHIPURAM DIST. 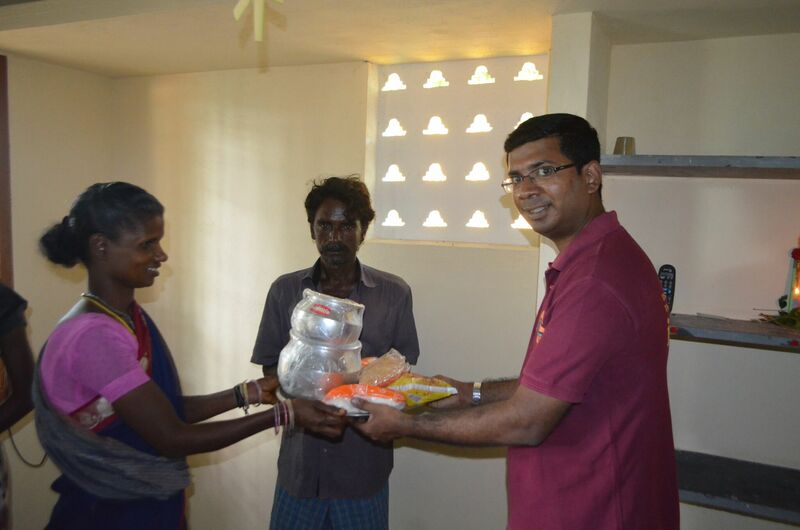 EUREKA HOMES – FLOOD RELIEF AID IN ANNA NAGAR, KANCHIPURAM DIST. The Eureka Homes low-budget housing project to aid the flood affected families has sucsessfully been completed in Anna Nagar village, Kanchipuram district. In continuation to this, individual toilets were also built for 13 houses recently. For few houses to which government electricity supply connection was not available, solar panels were fitted. Profuse thanks to Qualcomm India for their generosity. Completion of the project was celebrated in the village. Officials from Qualcomm India graced the occasion and they connected well with the people, distributed various gifts essential in supporting daily life. 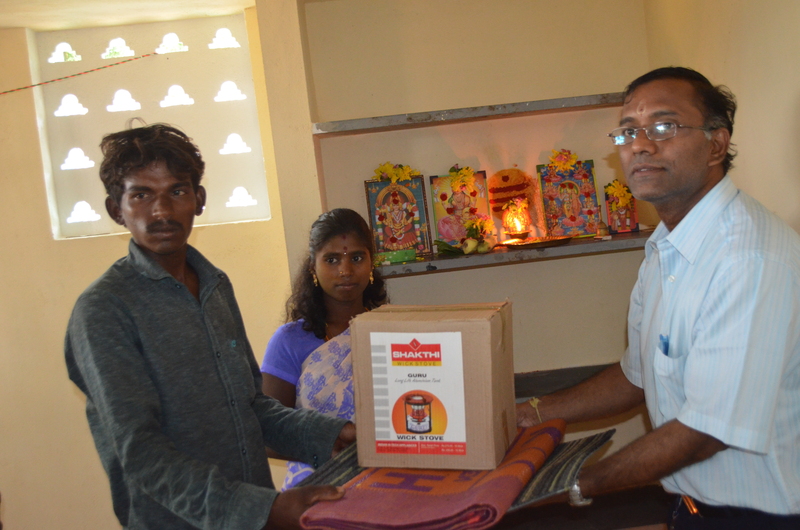 Officials of Bhumi and AID INDIA also experienced the joy of gifting essentials to the people. Celebrations included planting saplings, and music and dance by the local residents. The residents expressed their sincere thanks to all officials. Special thanks to Mr. Selvam, Project Co-ordinator for the zone from AID INDIA. But for his sincere and hard efforts, winning the confidence of people to start the project would have been nearly impossible. Below are the details of few beneficiaries who found a new ray of hope from the project. Murugan is a lumberjack in Anna Nagar village (Thiruporur). He lives with his family in a small hut. Murugan’s family consists of his wife Jaya, and their 6 children – Bhavani (20), Ponnamuthu (17), Devayani (12), Nandini (9), Poogudi (8), and Nagaraj (6). Mururgan’s monthly income is only about 2500 rupees. His wife Jaya works as a daily wage labourer when she can find work. Their oldest daughter, Bhavani, works in a Tablet company and she has only studied till 6th standard. The younger children are studying in 7th, 4th, 3rd, and 1st standards respectively. Raja is a farmer in Anna Nagar. His daily income is about 250 rupees. Raja and Chithra have four children and they all live in a small ramshackle hut. Their eldest daughter Sandhya is studying in 9th standard, the second one Sathya is in 8th grade, son Jayaram is in 2nd standard, and youngest daughter Karthika is just 3 years old and goes to a Balawadi. Raja is happy to help build his house through Eureka Homes implemented by Bhumi with help from AID INDIA and supported by Qualcomm. 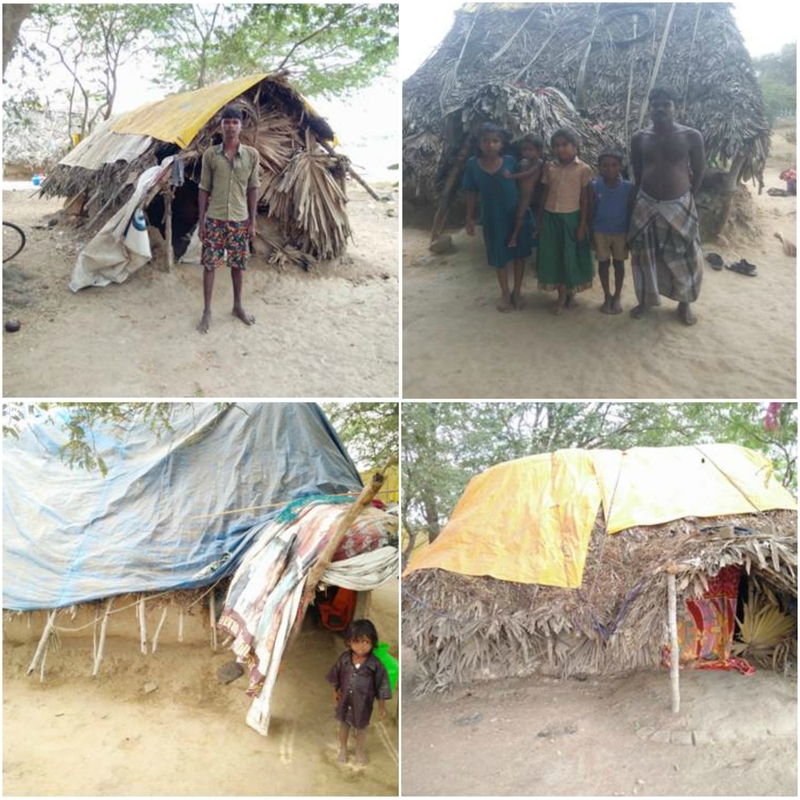 Shekhar and his wife Jayanthi live in a small cramped hut with their 4 children – Ponnumani (19), Shanmugham (17), Parameswari (14), and Manikanda (12). Ponnumani has completed 10th standard, Shanmugham and Parameswari are both studying in 7th standard and Manikandan is in 5th standard. Shekhar and Jayanthi are daily wage labourers, whose daily income is about 300 rupees. The monthly income of their household is only Rs. 2000. Anand and Devi are daily wage labourers who live in Anna Nagar village, Thiruporur. Their daily income is anywhere from 300 to 350 rupees and the monthly income of their household is only about Rs.2800. Devi and Anand have two children – Durga (age 4) is a kindergarten student at KVS Bharatmata school at Vadakumbadi and Saravanan(age 2) who goes to the nearby Balwadi (nursery). During the floods they sought refuge at a hill nearby where all the neighbours made a tent and stayed there for 3 weeks. Their roof had come down during the floods and so they had been stranded. Suresh and Dhanam are daily wage labourers in Anna Nagar, Thiruporur, whose household monthly income is about Rs. 2700. Dhanam and he have two children, Dhanush (4), who is a kindergarten student of KVS Bharatmata school at Vadakumbadi and Dinesh (3) who goes to the nearby Balwadi. Their hut was partially destroyed and the water had left a huge hole in the wall of the hut. It had to be covered with tarpaulin sheets and rocks. During the floods they sought refuge at a hill nearby where all the neighbours made a tent and stayed there for 3 weeks. Lakshmi (30) and Kuppan (45) live in the village of Anna Nagar in Thiruporur block of Kancheepuram district. Kuppan is a daily wage labourer. They have two daughters – Soundarya, who studies in the 4th std and Kumuda, who is 4 years old and goes to the nearby balawadi. They have been living in this village for a long time and their house is on their own land. The rains of last year damaged their hut badly and they were unable to afford a new house. 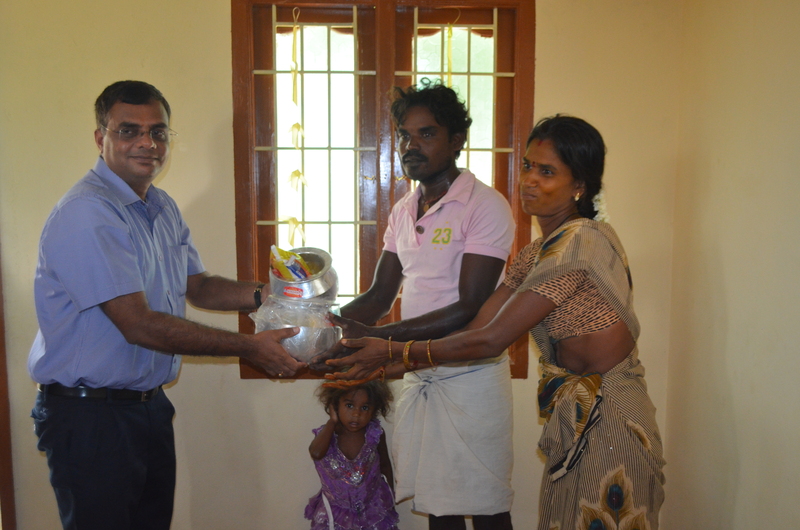 This is when AID INDIA identified them as potential beneficiaries in the Eureka Homes project and built them a new home. They are happy with their new home where they can live a safe and secure life without fear of the weather. 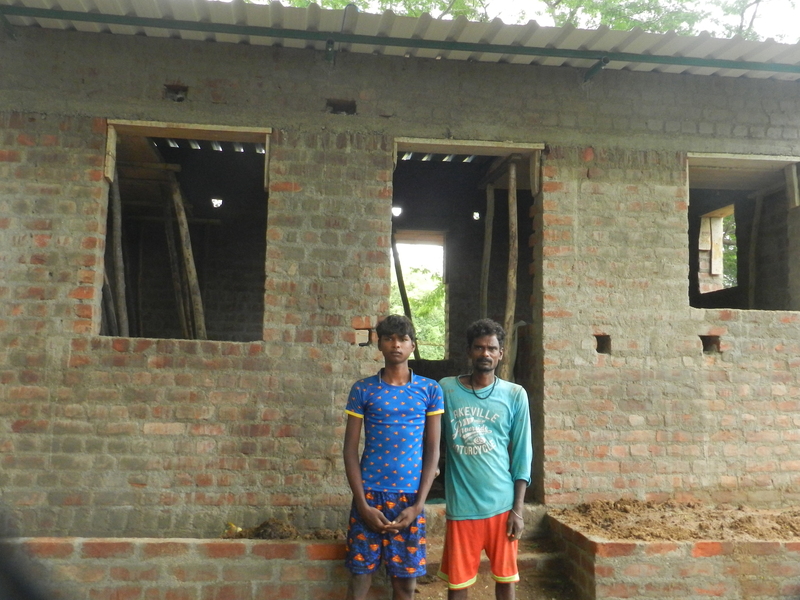 We asked Shanti and Mani a feedback on the house constructed and provided to them by AID India. Shanti says “We used to stay under a Tarp earlier. Our Tarp wore out during the rains, and we were in a lot of trouble as we did not have a place to live. Now we are very happy in the house you provided us. The house you provided us is very good. We would never have been able to construct our own house with our daily wages. We are very thankful to you for providing us this house”. Mani Says “We have 2 small children. My wife stays at home, taking care of our children. I am the only earning member of the family and I am a daily wager. In this new house, we are not worried about sun or rain. We are very happy. Thank you. I do not know how else to express my gratitude”. Kumar and Manjula’s is a family of 6- Husband, Wife and 4 Children. Manjula say, “We used to stay in a thatched house made of sand which drowned during the rain and floods. We are happy in the house you provided us. My husband and I are daily wagers in the farmland. My Children go to school- the first is Divya- she is in 8th grade, second is Siva- he is in 8th grade, third is Prem- he is in 4th grade and the fourth is Samanthi- she is in 3rd grade. Since we moved into this constructed house, we are very happy. It is very convenient and good for our children to study and sleep. Even if it rains now, we are not worried. We are happy. I have no words to thank you for providing us this house”. Selvi and Kanniah’s is a family of 4- Husband, Wife and 2 Children.Selvi and her husband are daily wagers and their children are studying in Balwadi. She says “we used to stay in a thatched hut. You helped us and brought happiness into our lives by constructing a house for us. Though it rains now, we are safe. You saw the difficulties we had during the monsoon, staying in the thatched hut and constructed a house for us. We are very happy now. Our life is more peaceful staying in this new house that you provided us”.